The sunset view of The Forks from the Historic Rail Bridge located in the City of Winnipeg in Manitoba, Canada. The bridge is traffic free and is used as a pedestrian crossing which spans the Assiniboine River. 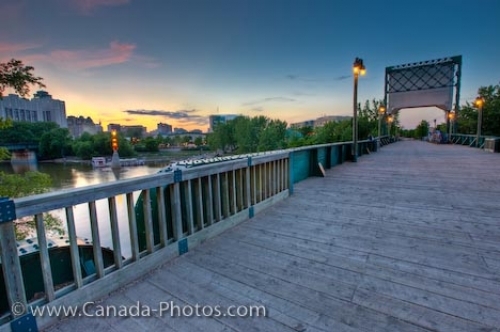 From the Historic Rail Bridge which spans the Assiniboine River at The Forks in the City of Winnipeg, the waterfront is beautiful as the sunset lighting filters across the sky. The lights along the Historic Rail Bridge start to glow as the sunset hues fade and the onset of darkness begins to take over. The Historic Rail Bridge is used by pedestrians and cyclists who visit The Forks, a national historic site in the midst of the City of Winnipeg. The bridge is a prime location to enjoy the beauty of The Forks, a name which was given to the area as this is where the Assiniboine River meets the Red River. Built in 1888, the bridge became an abandoned railway bridge until it was renovated to the crossing it is today. It has always been an important meeting place for people, dating back as far as 4000 BC when it was used by the Aboriginal people. Picture of a sunset over the Historic Rail Bridge which crosses over the Assinboine River at The Forks in Winnipeg City. Historic Rail Bridge spanning the Assiniboine River at the Forks, a National Historic Site in the City of Winnipeg, Manitoba, Canada.